The last two days have consisted of rocking Easton to sleep, comforting him when he cries, holding him nearly every second his eyes were open, and dosing Motrin and Tylenol round the clock. He’s had a consistent fever and his eyes scream misery. 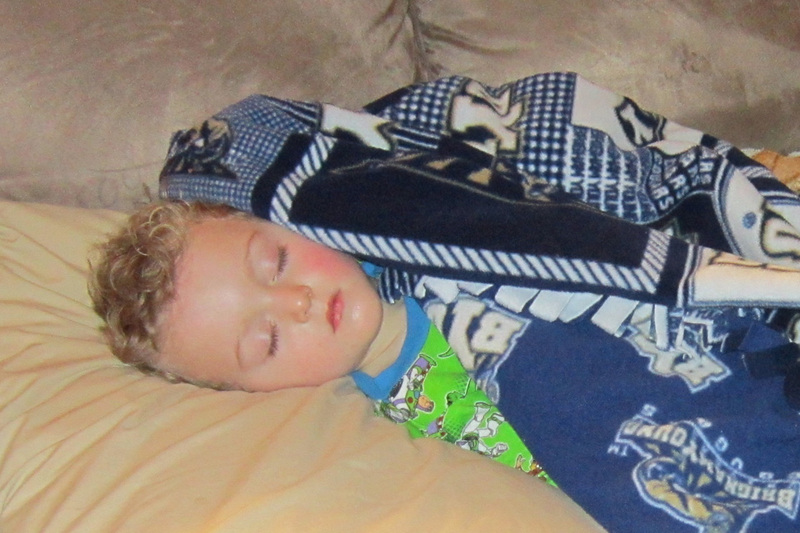 I have wiped numerous tears, fanned his sweaty back, and wiped his runny nose. While I have spent nearly the entire two days focused on Easton, Trevin has been neglected. I feel bad I haven’t spent as much time with him too, but what’s a mother to do? My Mom and Dad offered to watch Easton for a few hours last night while we hosted our weekly Family Home Evening at our house. Needless to say, I needed a break. I traveled to my parents house just before FHE. As I walked in my parent’s house, Easton refused to leave my arms. He wanted his coat and shoes left on. My Dad came towards us and reached his arms out to grab Easton. Immediately the screaming began. As much as I was looking forward to finally having a break, my heart ached. Easton loves his grandpa, but all he wanted was his mom. Grandpa took him from my arms, reassured me everything was going to be fine, and told me to leave while he walked into the other room. Finally. Relaxation and Freedom. Or was it? While I was walking to my car, I knew I needed a break, but I was sad to leave my little boy in such a sad way. He wanted his mom and nobody else. I decided to enjoy the night and trust that he would stop crying….eventually. After two hours of relaxing with our friends, I went back to my parent’s house to pick up Easton. I was expecting the worst. Surprisingly, my Mom said he did really well. He already had his shoes on ready to go and appeared to be excited to see me again. And I was excited to see him too! Today, it was the same routine. Rock him to sleep, hold him, check the temp, medicate, hold him again, wipe his nose, change his diaper, rock him to sleep again….over and over and over. My parents came later this afternoon to check in on us and to play with Trevin for a few minutes. As I was talking to my Dad, he asked how the day had been going. Basically, I told him all I felt like I had done was hold Easton and rock him to sleep over and over again. Pretty unproductive day right? My Dad looked at me and said, “There’s nothing better than holding a child you love so much…even if you haven’t gotten anything done.” And He’s Right. He’s absolutely right. The last two days I have been so focused on what I was missing out on, what tasks I needed to complete, and how unproductive my day’s have been that I forgot to focus on something that’s so important to me. Being a mother. I have decided to stop checking my phone as often, my e-mail as often, or the status updates on Facebook. Besides, do those things really matter? What’s more important than those you love? Why would I want to pass up an opportunity to hold my child (who never wants to be held) when he is sick or even when he’s happy for that matter? The last two days have helped me focus. ….because He’s right. There is nothing better. I love this post Nat! I made the same goal for the year as well. I was in Nephi this weekend and wondered if Easton was sick when I saw Colby and Trevin without you at church. I hope he gets better soon!